Nobody knows when they they might end up with trouble on their Android Phone and lose all their contacts . This thing happened for me twice and thanks to Gmail Contacts merging feature , i was able to easily restore my contacts . Unfortunately not all of the android users are lucky enough , but if you take some precautionary methods beforehand you can easily minimize the risk of losing your contacts from your android phone . 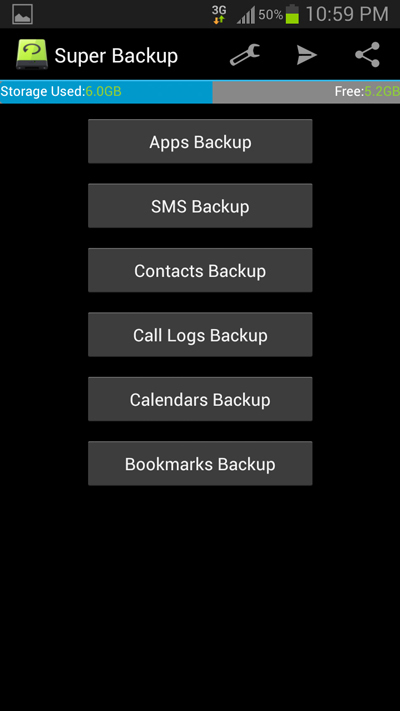 There are many methods by which you can backup your contacts on or off an android phone . Either you can make use of an free app from the android play store or use some of your phone’s inbuilt features to backup your contacts . While i won’t recommend any third party apps that backup you contact data online . Because you don’t know when these apps might end up using your contacts and start sending spam . Method 1: Backup your Android phone’s Contacts on your Google account. Method 2: Using Super backup to backup your contacts . Note : the first method requires an internet or data connection to function and the second method does require an data connection but it is not necessary . Follow the instructions below to backup and restore contacts on an Android Phone . This is the most easiest method to backup your android phone’s contacts . If you follow this method then all your contacts will be merged with your Google account and they will be automatically restored every time you associate your Gmail account on a new phone. Follow these instructions below to backup your contacts with your Google Account . 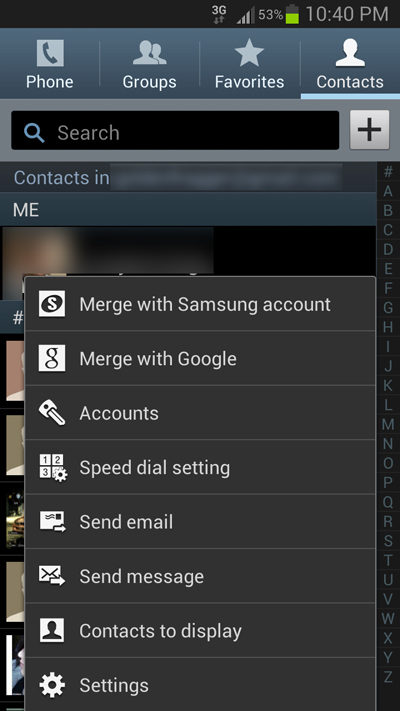 Open the contacts app on your Android phone and from the options and select “merge with Google “ . Its as simple as that and all the contacts from your android phone will be merged with your Google account now . The next time you change your phone , you just need to associate your Gmail account on your Android phone and all your contacts will be automatically updated . Super backup does the same job as backing up and exporting your contacts through a .Vcf file , which can be later used to restore your contacts . 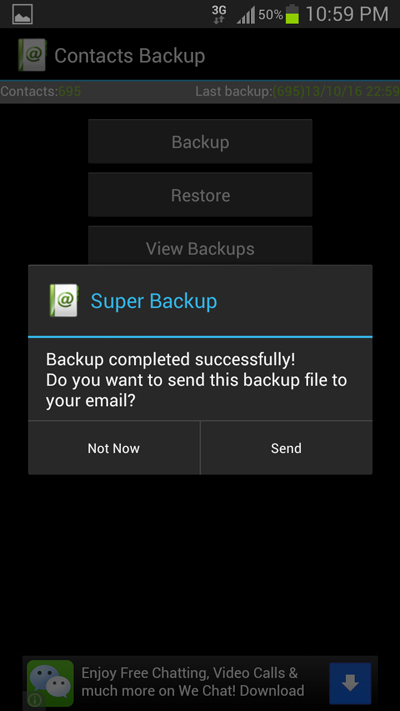 Although your Android phone already has this feature built in , Super backup provides an additional useful feature for forwarding the contact backup as a mail . Which can be used to keep a backup of your contacts in your email account . All in all , its a free app and using it is very easy . Further Super backup even allows you to backup SMS messages , Apps , Call logs , Calendars and bookmarks . 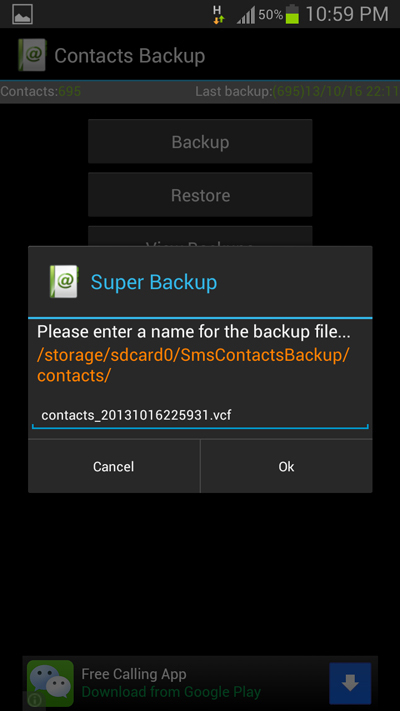 Follow these instructions to backup your contacts using Super backup . Step 1: Install and open the Super Backup app . Step 2: Select Contacts backup and on the next screen tap on the backupbutton . 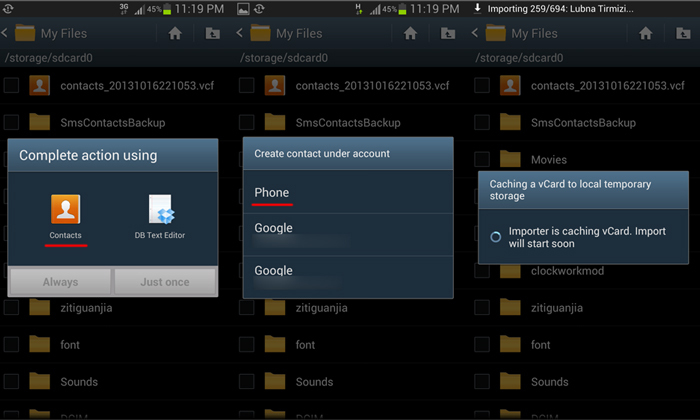 Step 3: Now give a name for your contact backup file or otherwise leave it as it is and tap on Ok . Wait for a few seconds till the app creates a backup of your contacts . Step 4: Next you will be prompted with an option to send your contact backup as a mail . Tap on OK and select any email app to send your contact backup as a mail . Restoring contacts from a .vcf file is very easy on an Android phone . If you need to restore your contacts backup , simply copy over the .vcf file on your Android phone tap on it to start the contacts importing process . Take a look on the screenshots below . Although The first method itself is more than enough to backup your Contacts , but if you want to move your contacts to another phone then the second method might come very handy . How to save your money 8 tips. how to improve your personality. HOW TO CHECK IF YOUR ROUTER IS HACKED? How do I hack into someone's bank account? write a program in c using switch case.